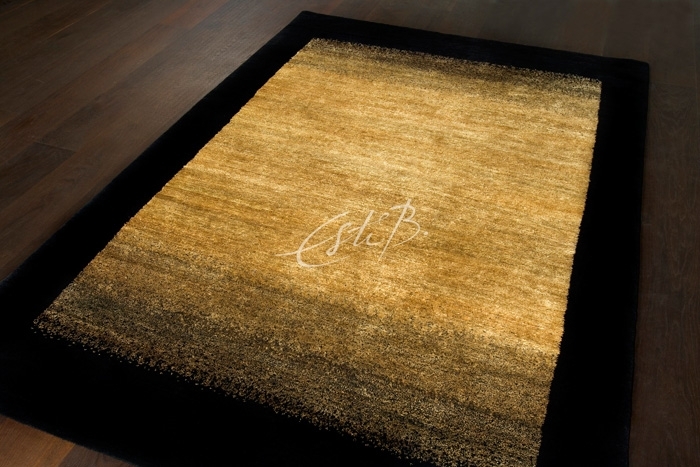 Esti Barnes’ textural, often intricately sculpted rug designs have received no shortage of industry recognition and awards. 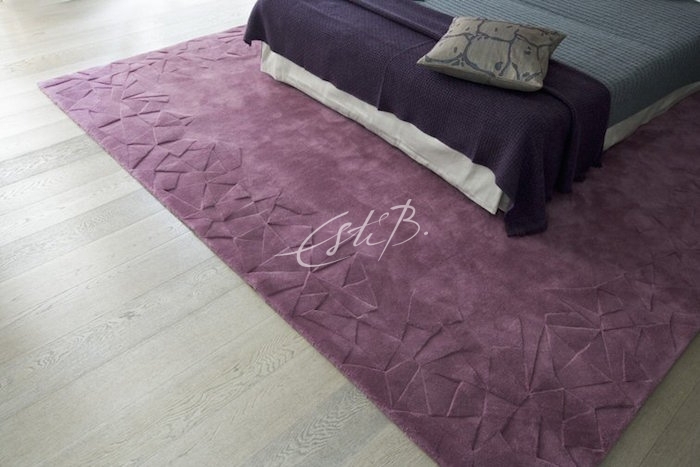 Although Esti is perhaps best known for trademark techniques such as surface carving, smooth colour transitions and decoupage, the complete Topfloor archive covers a wide range of styles, colours, materials and artistry. 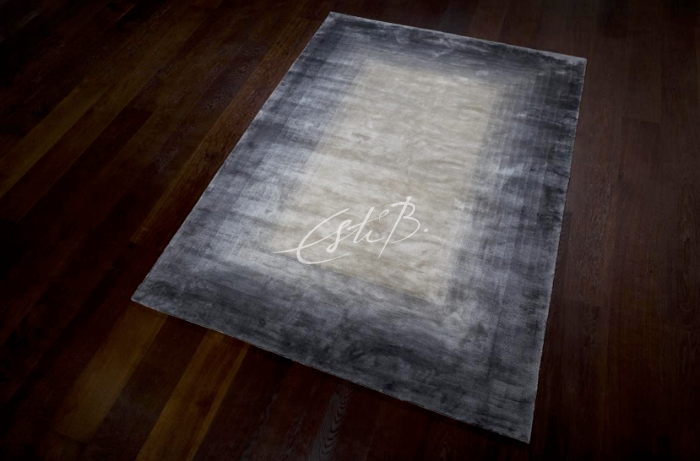 We’ve been looking back at some innovative but lesser known designs to discover the inspiration behind them and how they tie in with Esti’s ever-evolving design style. Two distinctive pieces that caught our eye are from the Ottomania collection, which, as the name suggests, is inspired by the cultural riches of the Ottoman Empire. This hand-tufted design, called Kaftan, draws on the geometric patterns used by the master tailors and imperial kaftan makers of the Ottoman court of the late 16th century. Reflecting the silk sheen and imperfections of handmade gowns, the colour gradually swells from one corner to the other and the edges are finished in a deliberately irregular way. From the same collection, we have chosen Bohca, which means ‘bundle cloth’. 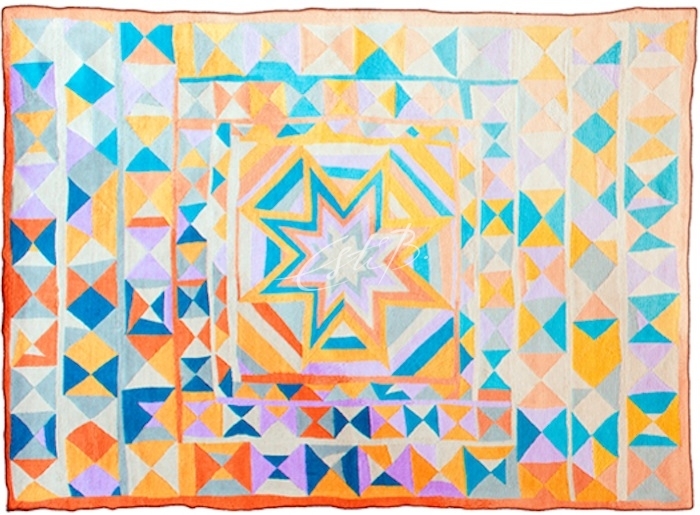 During the Ottoman period, hand-embroidered silk and satin patchwork bundle cloths were used for carrying the bride’s trousseau and other valuables. 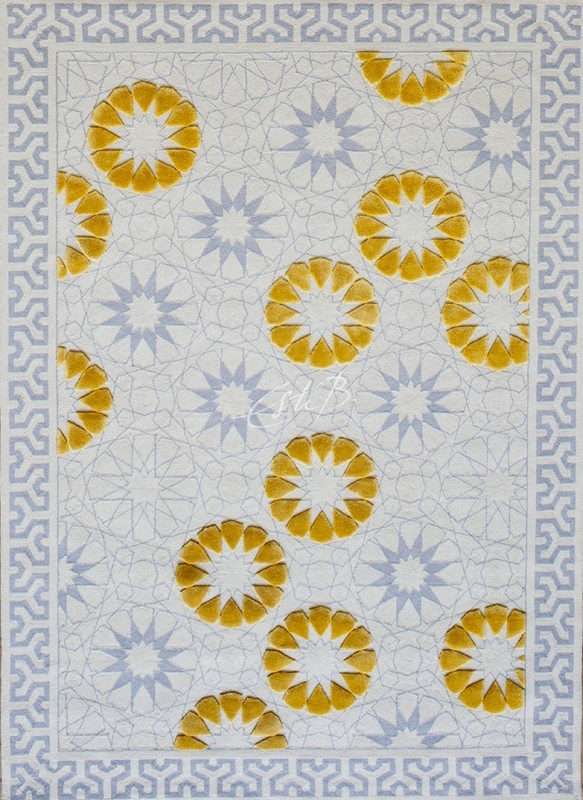 This rug perfectly combines antique textile and architectural references, in that the geometric floral patterns in the central section are a reinterpretation of a bohca from the 16th century, while the border pattern references the stone-carved architraves of Istanbul’s Sehzade mosque. More contemporary in style but again drawing on Esti’s own background is the playful Embed, which celebrates both the familiar and the exotic. 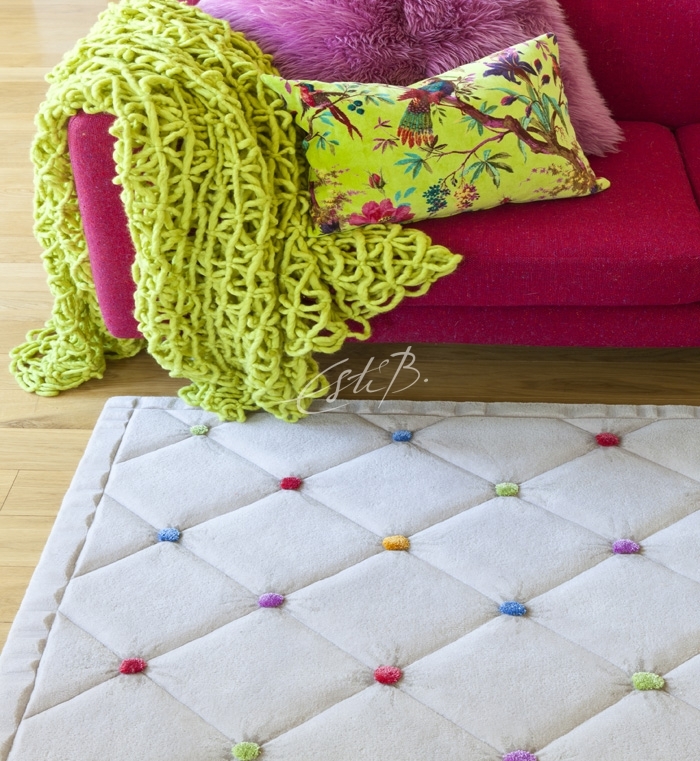 Its brightly coloured silk buttons and quilted surface are inspired by displays in the mattress and quilt shops of Esti’s neighbourhood when she was a child in Istanbul. Another strong influence for Esti is nature – the shapes of ripples on water, a cracked riverbed, the branches of a tree or, as in Esquire (above), the facets of a diamond. 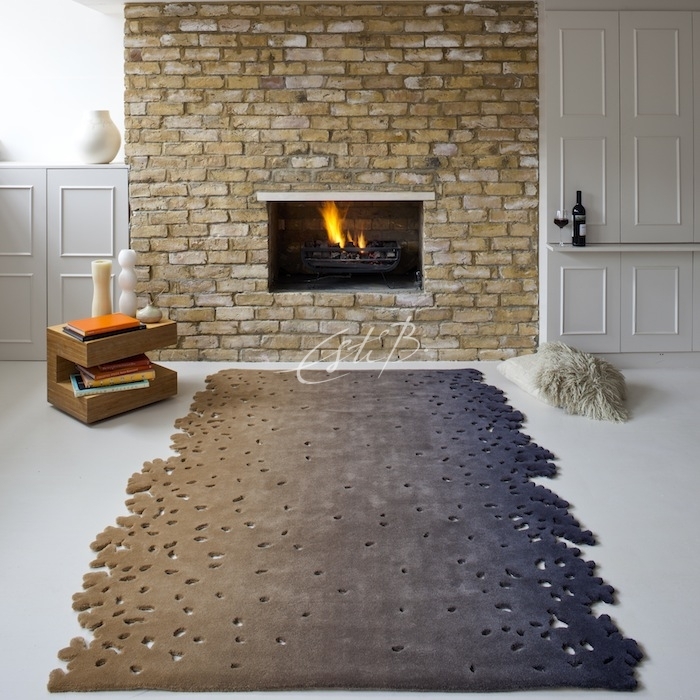 Although part of the 2D collection, Every Stone uses clever shading to create a three-dimensional effect in which the stones appear to float above the rug. It’s an understated, elegant design that feels calm and restful – the perfect finishing touch to a neutral colour scheme. Also taking its lead from nature is Erosion, which is reminiscent of a snowy mountain. 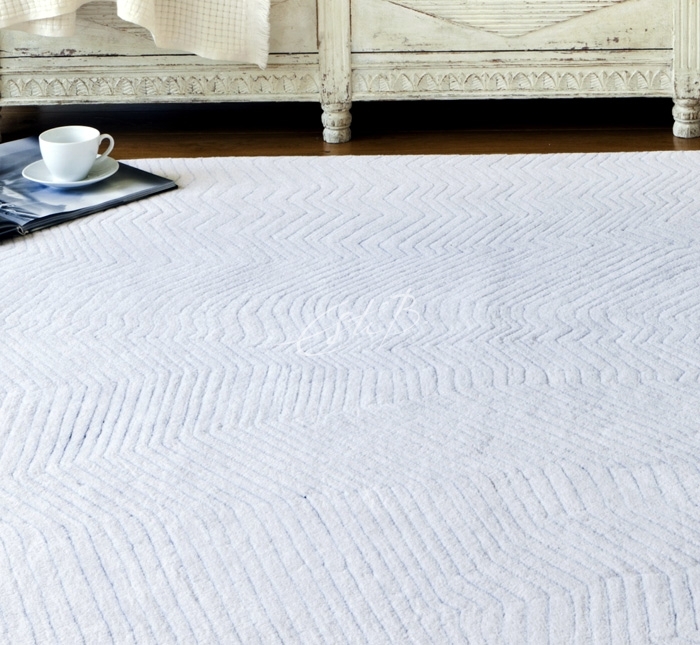 Contour lines ripple across its surface, creating a subtle but tactile and beguiling effect. To find out more about Topfloor’s full collection, to ask about a specific design or to talk to Esti about a commission, please contact us. 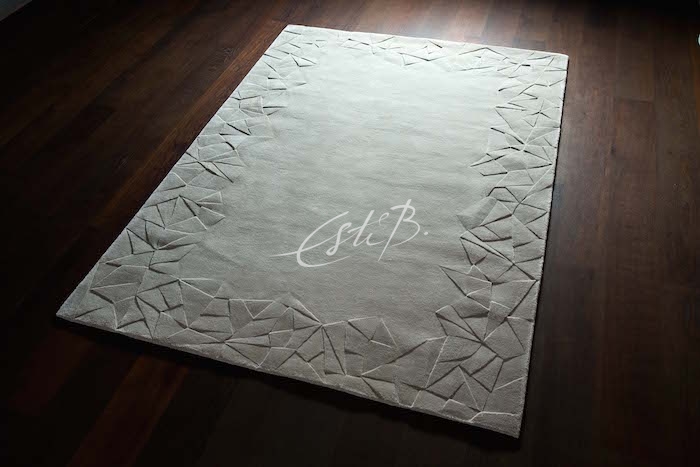 Surface carving has become one of Esti Barnes’s most popular trademark techniques, but where did the inspiration for this unusual effect come from, and how did Esti turn the initial idea into a reality in her rug designs? 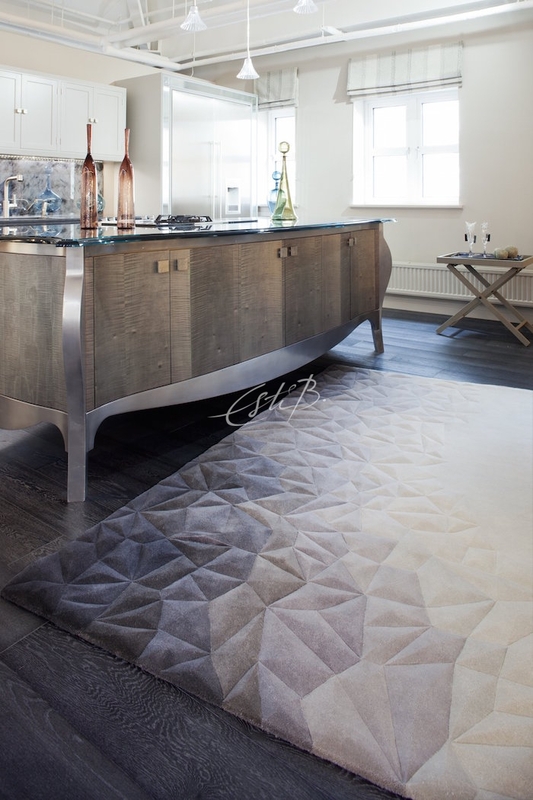 In this blog post we will explore the story behind Esquire, Everest and Esquire Evolution, three Topfloor rugs that epitomise the sculpted-pile technique, and that paved the way for subsequent 3D designs in our collection. 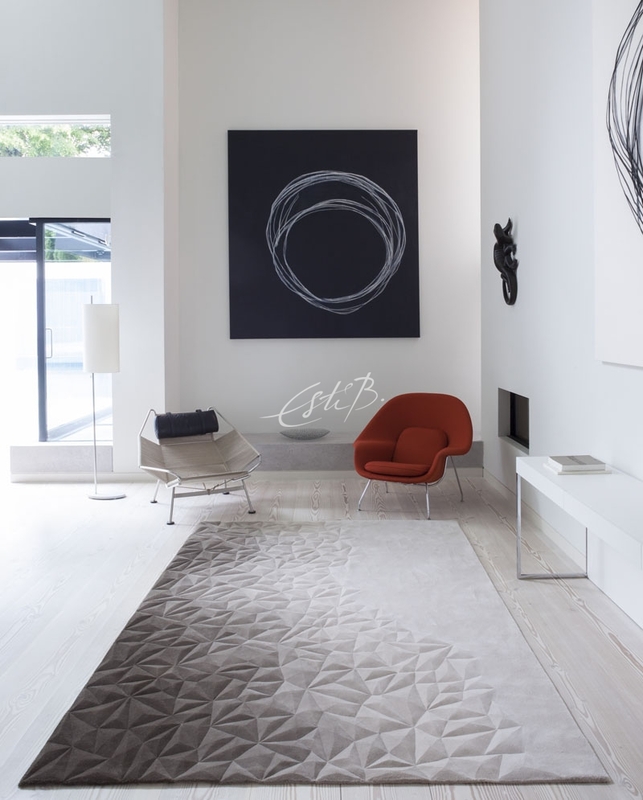 Esti has always had an interest in creating visually arresting pieces that bridge the gap between ‘floor covering’ and ‘art work’, and Esquire is a fabulous example of this. 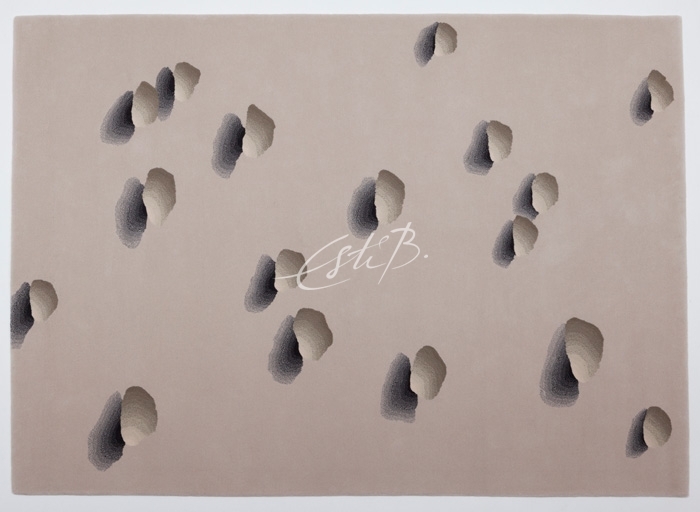 Created in 2006, it was the first Top Floor design that used surface carving and, as with many of Esti’s designs, was inspired by the natural world – in this case, desert sand dunes. The pile of Esquire is sculpted with sharp edges like the wind-shaped crest of a sand-dune or the facets of a piece of cut crystal, exploiting the play of light and shade across its three-dimensional surface. The idea was a simple one, but the execution was very demanding and required a high degree of skill, with all of the surface carving painstakingly carried out by hand. The originality and flair of Esquire was recognised when it won two industry awards in quick succession: first, in 2007, ‘Best of Year’ in its category at the annual design awards of leading US magazine Interior Design; then, the following year, ‘British Design of the Year’ at Elle Decoration’s prestigious British Design Awards. It is now regarded as the most iconic of all of Topfloor’s designs. The inspiration behind Everest, also created in 2006, is clear from its name; the design itself came about as a result of the different styles of carving Esti and her team had experimented with while working on Esquire. One of these ‘prototypes’ became the sculpted border of Everest. Although these designs are undoubtedly contemporary and cutting-edge in style, they manage to retain a timeless quality that makes them suitable for any room scheme. 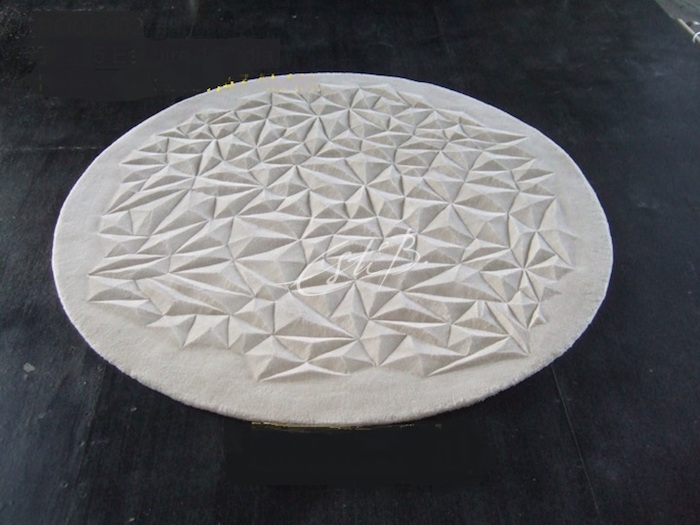 It is the strong creative vision behind innovative designs such as these, combined with an intimate knowledge of raw materials and weaving techniques, that has helped Topfloor rise to the top of the industry and become known as a market leader in rug design. For more information about Topfloor’s collection or to enquire about a specific design, please contact us.